Preparation time: 15 minutes. Chilling time: 30 minutes. 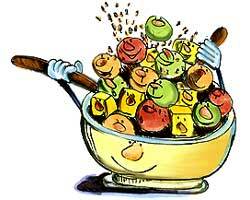 Combine fruits in large bowl. Combine honey, vinegar, oil, shallot, mustard, and poppy seeds in small jar; cover tightly and shake to blend. Pour dressing over fruit and toss to coat. Cover and chill for 30 minutes before serving. Exchanges per serving: 1 1/2 fruit. Carbohydrate choices: 1 1/2. This recipe was developed by Nancy Cooper, a Contributing Editor of Diabetes Self-Management. Nancy is a Diabetes Nutrition Specialist at the International Diabetes Center in Minneapolis, Minnesota.